Every, J.L.R. (2009). Neotropical Goodeniaceae. 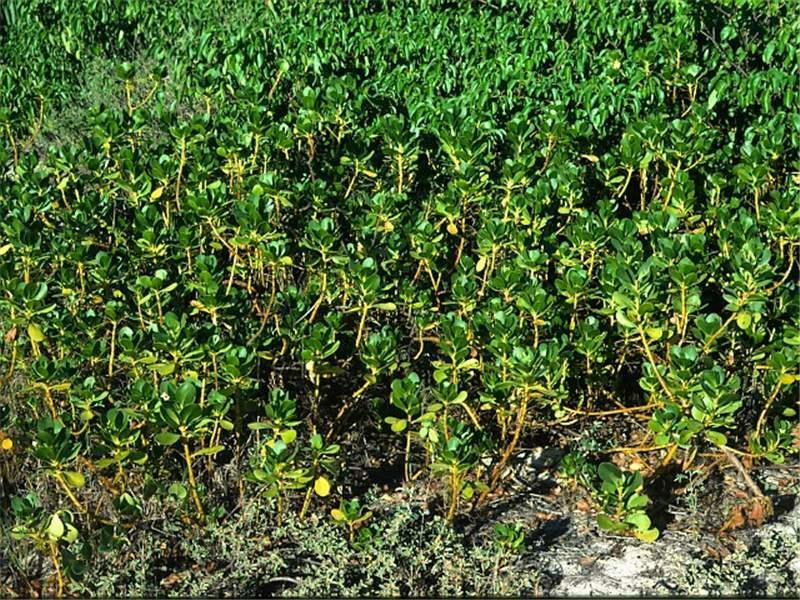 Small trees or spreading shrubs. 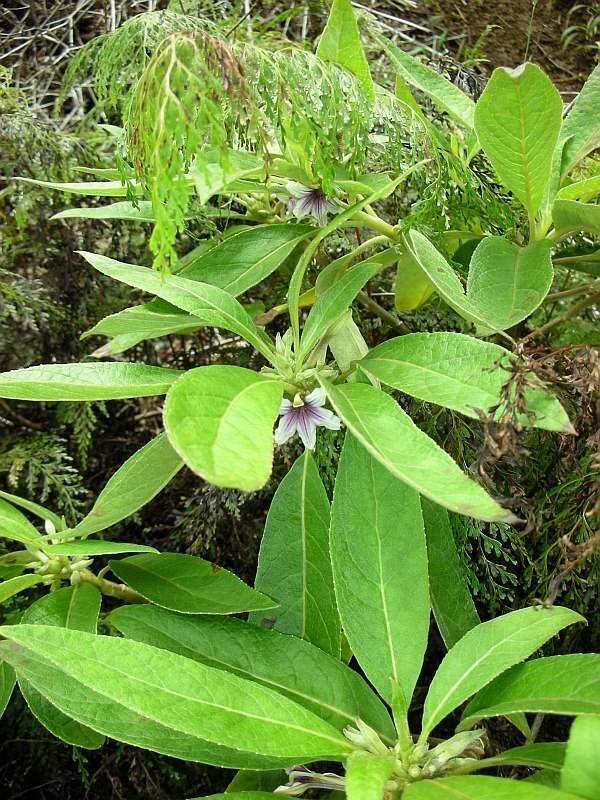 Leaves simple , alternate , spiraling, petiolate , fleshy , glabrescent, margin entire , venation pinnate , midrib prominent ; exstipulate , axillary hairs long. Inflorescence axillary dichasia or cyme , pedunculate. Flowers hermaphroditic, zygomorphic , 5- merous , bracteolate; calyx synsepalous, cup-like, persistent ; corolla tubular, with adaxial deep split (exposing indusium), fan-like, winged (appearing trilobed), hirsute within; stamens 5, opposite sepals, free of corolla , anthers dehisce in bud , introrse; gynoecium syncarpous, ovary inferior, carpels 2, locules 2, style with hairy pollen -collecting indusium and stylar cup, stigma bilobed. Fruit a drupe , hard, indehiscent with thick endocarp and fleshy or corky mesocarp . Seed 1 per locule . 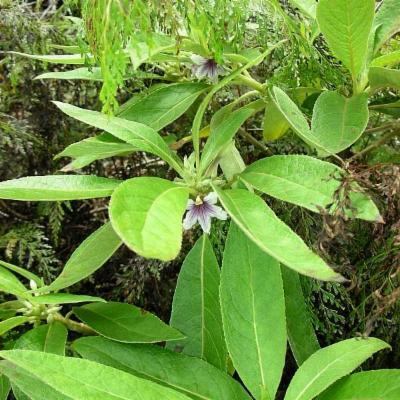 Currently circumscribed in the Asterales as sister group to Calyceraceae and Menyanthaceae (Stevens 2008). Placed in the Campanuales by Cronquist. 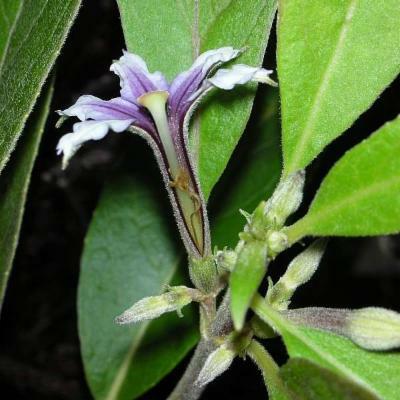 1 Genus: Scaevola L. with 3 species. Scaevola plumieri occurs throughout the Neotropics. 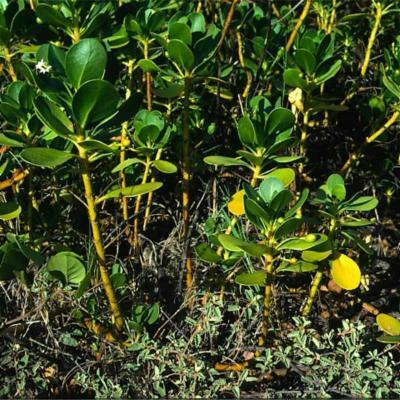 S. wrigtii is endemic to eastern Cuba. 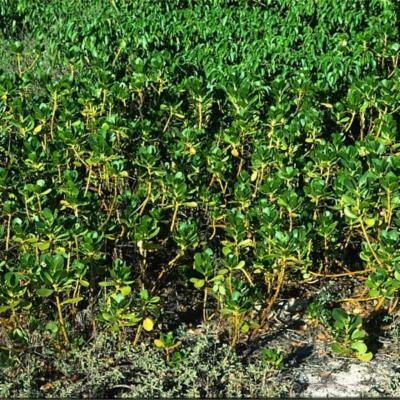 S. taccada is an exotic invasive found in the British Virgin Islands. 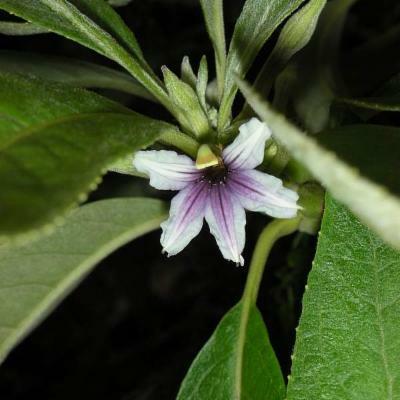 Scaevola: (from the Latin scaevus meaning 'left-handed') - a reference to a legendary one-handed Roman hero Mucius Scaevola, who was likened to the genus, as its flowers appear to have been cut in half. 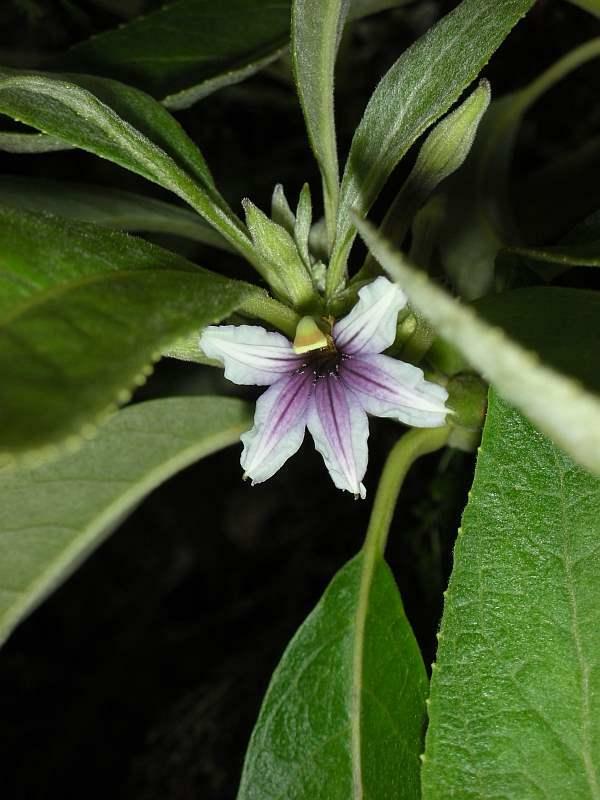 Scaevola plumieri (L.) Vahl can be found throughout coastal areas of the Neotropics. 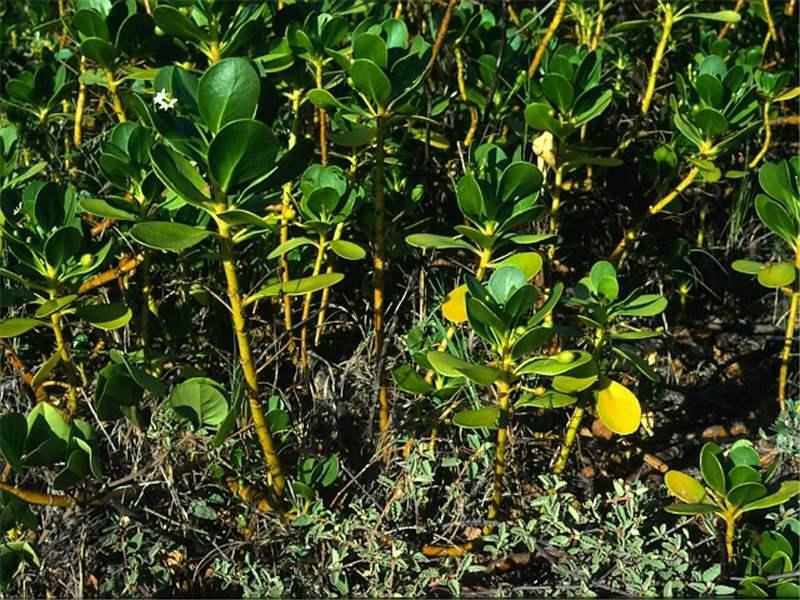 S. wrigtii (M.Gomez) is endemic to eastern Cuba. S. taccada (Gaertn.) Roxb (= S. sericea Vahl) is a paleotropical species naturalized in the British Virgin Islands. Members of the Neotropical Goodeniaceae are readily distinguished by an unique floral character known as the 'indusium' which is a cup-shaped specialized stylar outgrowth below the apex of the style (that attracted the interest of Charles Darwin), and which acts as a pollen presenter. The fan-shaped corolla and marginal membranaceous wings making each lobe appear trilobed. Barbulae (hairy outgrowths) found at the edge of petal wings and down into the throat. Indehiscentfruit, which lacks a clear demarcation between the hard endocarp and outer layers with unthickened cell walls. Brizicky, G. K. 1966. The Goodeniaceae in the southeastern United States. J. Arnold Arbor. 47:293-300. Carolin, R. G. 1966. Seeds and Fruit of the Goodeniaceae. Linn. Soc. N.S.W. 91: 58-83. Carolin, R. C. 1992. 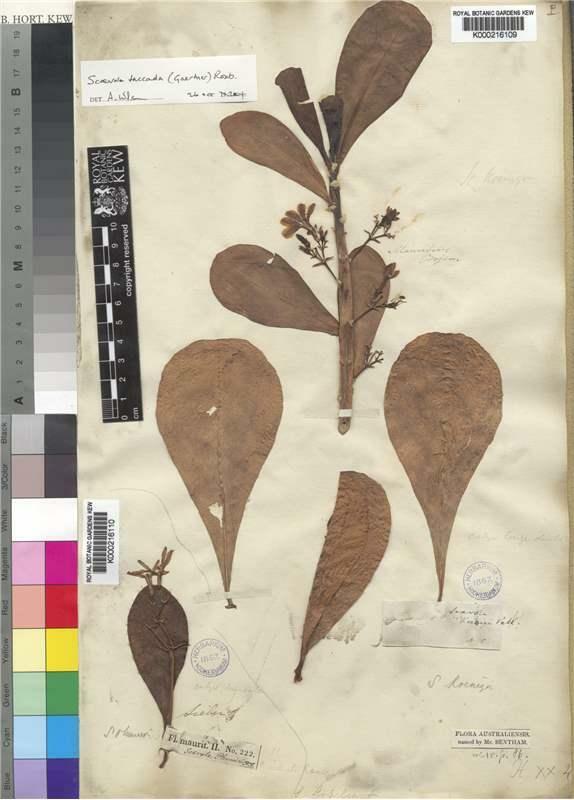 Flora of Australia 35, Brunoniaceae, Goodeniaceae, p. 4-300, Australian Government Publishing Service, Canberra. Cronquist, A.1981. An integrated system of classification of flowering plants. Colombia University Press, New York. Dassanayake, M. D. 1997. 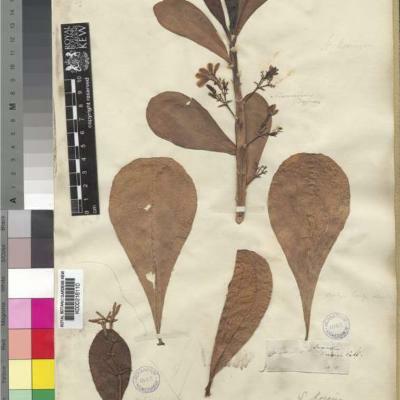 A revised handbook to the flora of Ceylon, vol. 10: 284-7. A.A. Balkema, Rotterdam. Ghisalberti, E. L. 2004. The Goodeniaceae. Fitoterapia 75 (5): 429-446. http://dx.doi.org/10.1016/j.fitote.2004.01.018. Gustafsson,M. H. G. 2004. Goodeniaceae. Pp. 173-4. In: Smith, N., Mori, S. A., Henderson, A., Stevenson, D. W. and Heald, S. V. (eds.). Flowering Plants of the Neotropics. The New York Botanical Garden, Princeton University Press, Princeton. Heywood, V.H., R.K. Brummitt, Culham, A. and Seberg, O. (eds.). Flowering plant families of the world, p.159. Kew: Royal Botanic Gardens, Kew. Howarth, D. G., Gustafsson, M.H.G., Baum, D. A., Motley, T.G. 1996. Phylogeny of the Asterales sensu lato based on rbcL sequences with particular reference to the Goodeniaceae. Pl. Syst. Evol. 199:217-42. Howart, D. G. et al 2003. 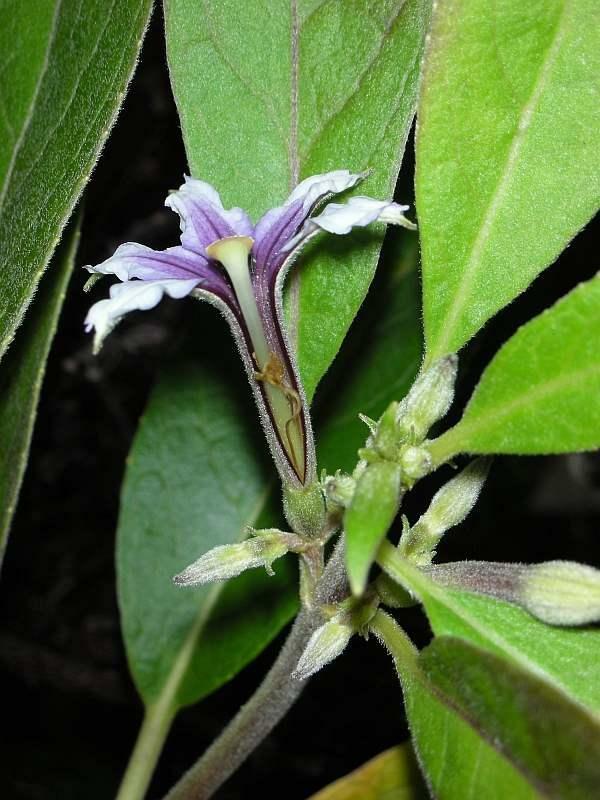 Phylogenetics of the genus Scaevola (Goodeniaceae): Implication for the dispersal patterns across the Pacific Basin and Colonisation of the Hawaiian Islands. American Journal of Botany 90(6): 915-923.